ANTOFAGASTA, Chile (AFNS) , June 14, 2018 — Twelfth Air Force (Air Forces Southern) sent a Mobile Training Team to Chile to conduct training with the Chilean Air Force on Crash Damaged Disabled Aircraft Recovery, May 13 to June 8, 2018. The CDDAR Mobile Training Team consisted of four seasoned crew chiefs who have experienced being an aircraft crash team chief. The crew chiefs hailed from Davis-Monthan Air Force Base, Arizona; Hill AFB, Utah and Peterson AFB, Colorado. “I view the MTTs as a key tool in our Security Cooperation apparatus,” said U.S. Air Force Lt. Col. Hector L. Gonzalez, Embassy Santiago, Chile, Theater Security Cooperation Air Force section chief. 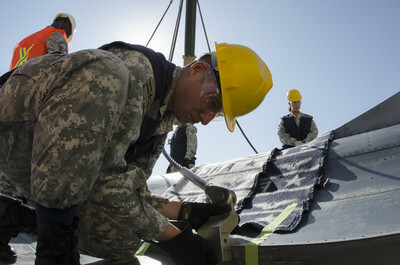 The two-week CDDAR course was instructed in English , the same as the U.S. Air Force CDDAR course. This was an opportunity for the Chilean Airmen to practice speaking in English as they already often read in English, since their aircraft technical orders are the same as the U.S. Air Force. Thirty-five Chilean Airmen graduated the CDDAR course from both locations. The Chilean Airmen hailed from F-16 maintenance career fields to include: crew chiefs, jet engine mechanics, sheet metal technicians, avionics mechanics, safety non commissioned officers, egress technicians, non-destruction inspection technicians, aircrew flight equipment technicians, maintenance officers and quality assurance inspectors. Upon completing the final objective, U.S. and Chilean Airmen conducted a team debrief over what went well and what could’ve been improved. The following day the U.S. Airmen held a graduation ceremony for the newly CDDAR certified Chilean Airmen.